Hatching Bantam Eggs - you choose; Mama hen? Or incubator? Hatching out your own eggs under a broody bantam hen is so rewarding. The little hens are so business like and determined, and all have their own little personality. If you’re already bemused by Bantams, you’ll want to let one of your hens go broody and become a mama. 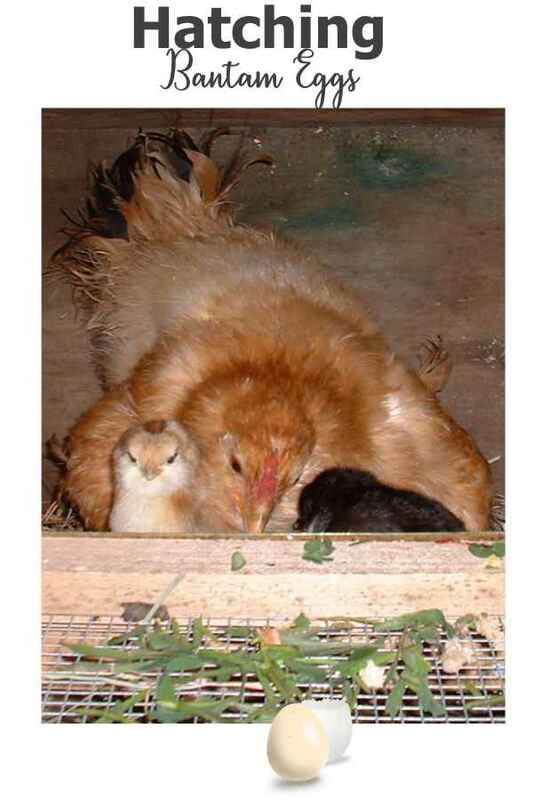 The origin of the phrase ‘as protective as a mother hen’ will be evident as soon as they go broody. The broody trait has been bred out of most types of chickens, as if you’re not very supportive of the hens need to raise a family, that trait quickly gets obsolete. Bantams are some of the few that have retained the characteristic, fortunately for those of us that like to watch a hen perform her instinctive role in chicken society. Many Bantam hens are tiny, barely more than a bag of bones wrapped in feathers. This poses a slight problem in increasing your chicken flock, as realistically, they can only hatch out four to six eggs at a time safely. Due to the turning of the eggs that they do every few hours, some of the developing embryos in a large clutch of eggs could be killed by being left out in the cold for too long. However, in one of nature’s minor miracles, hens will happily brood many more chicks than they hatch. If you can time it right, you can hatch out more eggs in an incubator for her to adopt. Grafting chicks onto a broody hen can only be done by stealth in darkness, and by the morning she won’t be aware that she has increased her family. The addition of a heat lamp for the first couple of weeks will help if she can’t keep them all under her wings. 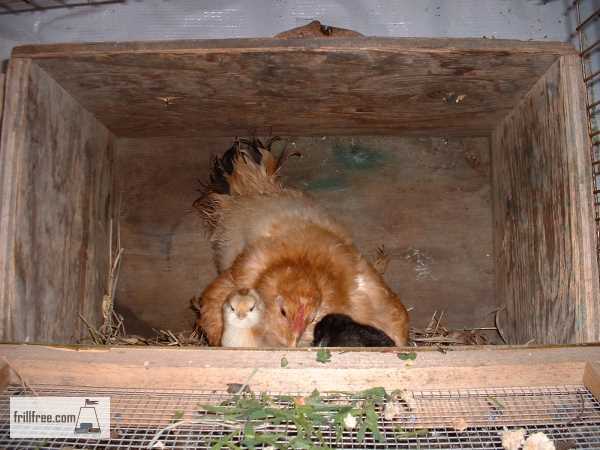 Many times, your hens will try and set on eggs that other hens keep adding to in the regular nesting boxes. This is usually a disaster, so collect all the eggs until you have a clutch of them ready. Mark in pencil an 'x' on one side, and an 'o' on the other if you're setting them in an incubator so you know which side you have to turn. Turning them is important, and has to be done five times in 24 hours until three days before they're due to hatch. Now do you realize why a broody hen is a good thing? Once you are sure that the hen is really broody and serious about raising a family, separate her from the other hens and especially the roosters for the most part of the day. I use a small box with enough room for her to move around if she wants, and a door that opens to create a ramp for her chicks when they hatch. Allowing her out to mingle for a little while in the evening just before the rest of the flock goes back in to sleep is ample. Twenty minutes is enough time for her to stretch her wings, cluck and fuss, get a drink and possibly some grain or grass, relieve herself just in time to get back on the eggs before they are chilled. Most eggs will start to ‘pip’ which is when the chick starts to peck through the shell to hatch in about 20 to 21 days. The eggs in an incubator may take a day longer than the eggs under a hen, so you can actually start the incubation of eggs in the incubator a day ahead. Hens can’t count – either the days that they’ve been setting, or number of chicks that hatch. Once most of the eggs have hatched, she’ll leave the nest with them and teach them the rudiments of chicken life, such as how to drink and eat. Chicks can go up to 48 hours after hatching without eating, although they benefit from a drink earlier. They also can’t tell what kind of eggs they’re hatching – as long as a baby comes out, they’re willing to mother it. This means you can hatch other poultry, even ducks or quail under a Bantam hen. The only problem you might encounter is the sheer size difference between eggs, so a clutch of regular chicken or duck eggs might only total three - but a clutch of quail eggs could be as many as ten or twelve. 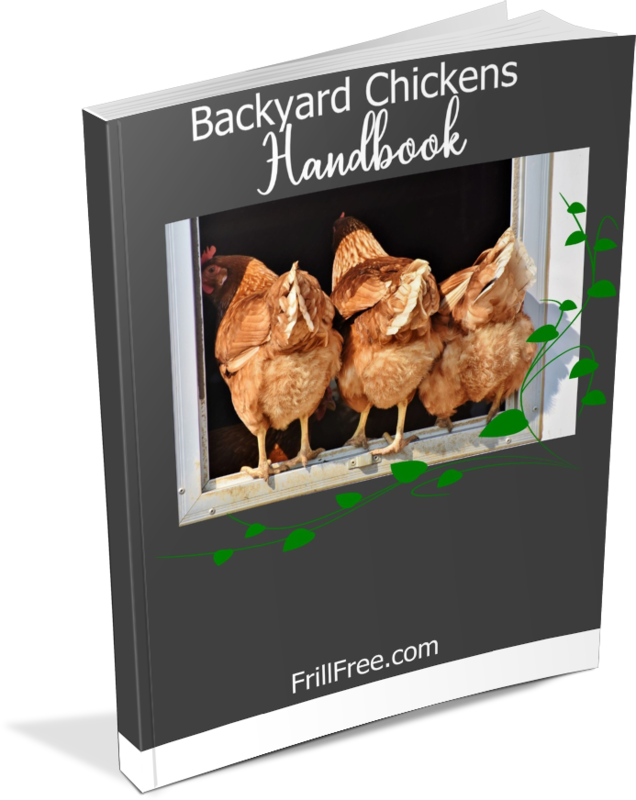 If you’re lucky enough to have Bantams, allow them to hatch out some of their own babies, and you’ll be thrilled to watch their antics as they learn the serious business of being a chicken. Make sure you finish all your chores first before you start watching them – you’ll be too fascinated to leave.